During his years of practice Mr. Chioini has literally conducted thousands of trials and hearings related to family law matters, both pre and post-judgment. These matters have involved a wide spectrum of issues from derivative and shareholder disputes within a divorce action to international child custody matters. His approach to domestic matters is a no nonsense approach woven together with an astute ability to resolve matters by creating unique solutions to unique matters. He further believes that no two legal matters are alike and spends a great deal of time with clients to understand their positions and concerns and to assist them with their legal road map. Mr. Chioini was one of the first attorneys in Macomb County to receive the distinguished Martindale-Hubbell “AV Rating” for family law, which is the highest rating an attorney can receive upon evaluation of colleagues and judges. An AV rating means that an attorney is considered preeminent in their specific area of expertise. He also BEEN regularly honored in Detroit Business Magazine as a Top Attorney in both the areas of Family Law and Business Law and he is regularly honored as a Super-Laywer, a designation given to less than 3% of attorneys in Michigan. While a litigator at heart, Mr. Chioini recognizes the importance of alternative dispute resolution in all matters and was one of the founding organizers of the Macomb County Dispute Resolution Center. It is a highly renowned non-profit organization utilized by local courts to alleviate heavy docket issues and to assist parties in a more satisfying fulfilling resolution, while mitigating the high costs of litigation. He has also served as a qualified mediator/arbitrator for American Arbitration Association for over 15 years and continues that role today in the private capacity and is quite frequently being appointed by the court an by colleagues to serve as facilitator and arbitrator in a variety of domestic and civil matters, in and out of the County. From 1986 to 1988, Mr. Chioini held the prestigious position of Commissioner of the State Bar of Michigan and has continued to chair and serve on numerous committees since, including the State Bar Representative Assembly for over 4 terms and the family law committee for 6 years. He also served as President of the Macomb County Bar Association in 1983 as well as Vice President, Secretary, Treasurer, and Director. 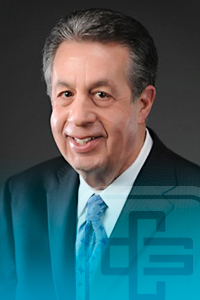 He has been an active member of the Italian-American Bar Association of Michigan for over 20 years and was that organization’s prestigious award: Phillip F. Greco Award for Excellence in 2009 by a unanimous vote. During his legal career Mr. Chioini has been asked to administer and speak on a variety of domestic matters and frequently sits as a panelist for the Family Court’s initiated S.M.I.L.E. Program. S.M.I.L.E. is a court ordered seminar for all parties going through the divorce process who have children who are minors. Before his career as an attorney, he worked tirelessly as a tile mason and then as teacher in inner city Detroit. Mr. Chioini maintains his love for teaching by serving as a professor of the paralegal program at Macomb Community College. Areas of Practice: Complex Domestic Litigation/Family Law (Divorce, Custody, Paternity, Support, Parenting Time, Business Evaluation), Business Litigation, Construction Litigation, Contracts, Real Property, Probate/Estates, Local Counsel/Liason. Education/Professional Background: Western Michigan University (B.S., 1966); Detroit College of Law (J.D., 1971). Sigma Nu Phi. Macomb County Friend of the Court and Macomb County Prosecutor’s Office, 1971-1979; Macomb Community College Adjunct Professor, 1995 – present, Family Law and Law and Ethics. 100 hour ICLE Family Law Certification. Martindale-Hubbell (www.martindale.com) – “AV Preeminent Rating” (highest legal professional ranking by peers – AV rating means attorney is preeminent in their area of practice).